Thanks to Dr. David Cohen, Herzliya Medical Center (Israel), for contributing this case. To contribute a Case of the Week, follow the guidelines on our Case of the Week page. (1) We have completed the conversion of these chapters to Topic format: Fallopian tubes, Testis, and should finish (or be close to finishing) the remaining chapters by the USCAP meeting in March 2014. We are also adding links to related Jobs, Fellowships, Conferences, Cases of the Week and Books for each chapter. (2) We have finished the preliminary version of the Thyroid Gland Competency Assessment, by Zubair W. Baloch, M.D., Ricardo R. Lastra, M.D. and Michelle R. Pramick, M.D., posted in the Thyroid and Cytopathology chapters. 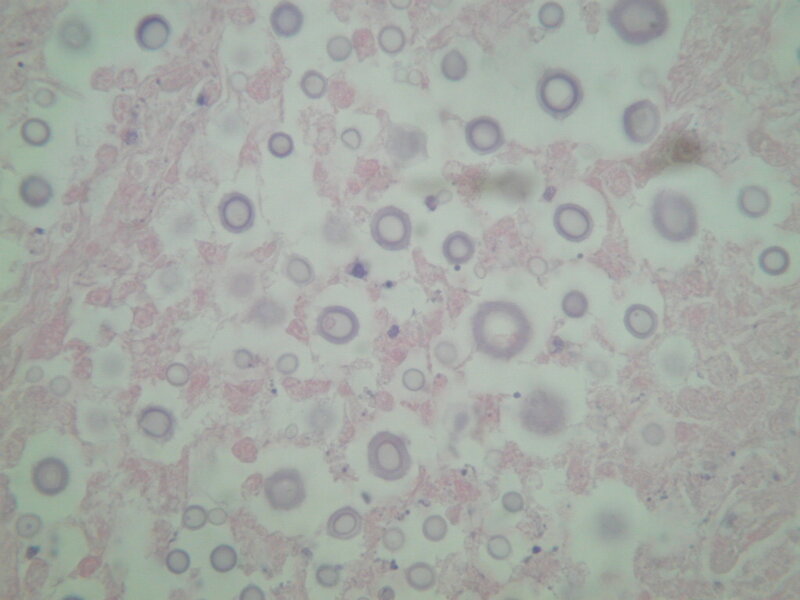 We will also be adding some additional cytopathology images to these sections. (3) We recently updated the Stains and Molecular Markers chapter and the CD Markers chapter for these biomarkers: CD14, CD15 and variants, CD16 and variants, CD17 and variants, CD18, Alcian blue, ALK and alpha-1-antitrypsin. The plan is to update each biomarker every 1-2 years, although we are a little behind schedule. We will also be adding the new CD Markers, and other new biomarkers as articles are published about them in the pathology literature. Email Dr. Pernick at NatPernick@hotmail.com with your suggestions of biomarkers to add. (4) Lippincott Williams & Wilkins (LWW) added several new books to its Books page, click here. We continue to add relevant recent titles to the main page of all Chapters. Books are also listed on the main Books page by subspecialty, by author, and by publisher (for LWW, CAP, ARP and WHO books). We also have a separate list of New Books recently posted. 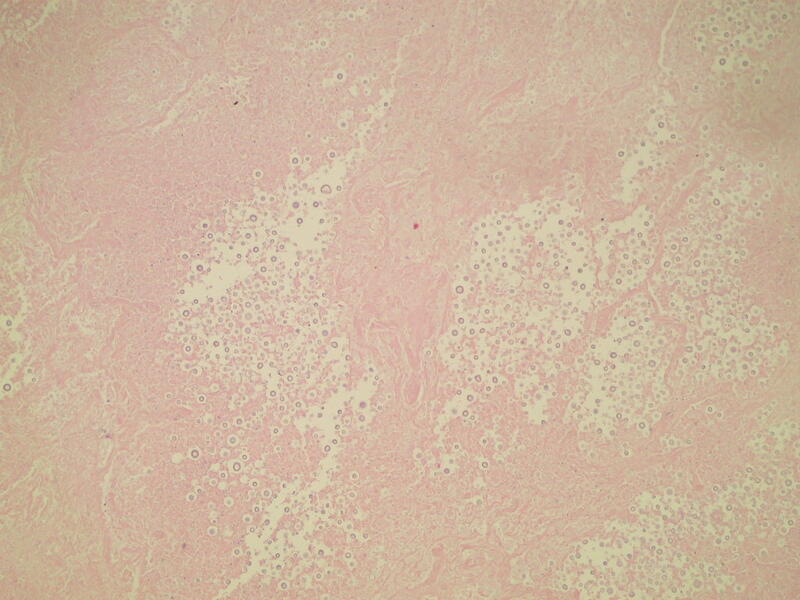 A 65 year old woman receiving immune therapy for rheumatoid arthritis presented with a right lower lung mass. 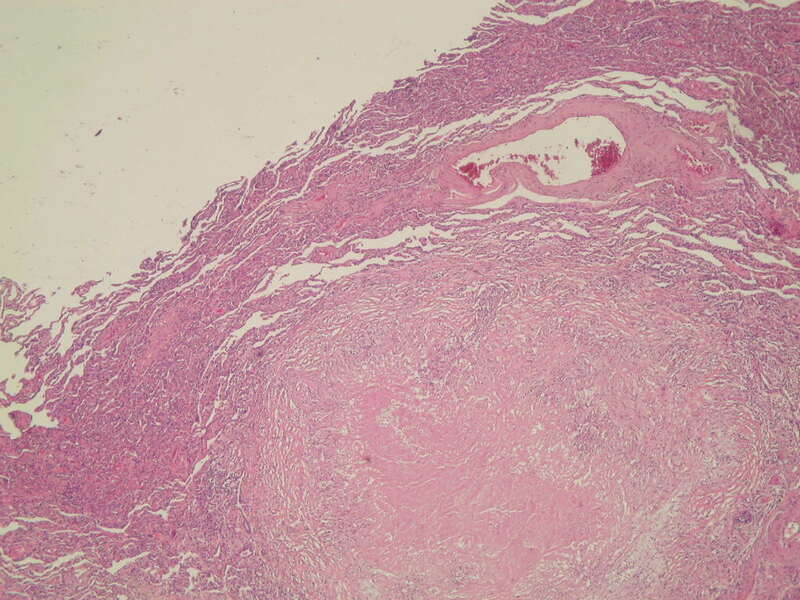 For intraoperative consultation (frozen section), a peripherally stapled wedge of lung parenchyma measuring 9 x 5 x 2 cm was received and sectioned, showing a reasonably well circumscribed nodular mass 9 x 1.5 cm immediately beneath the pleura. 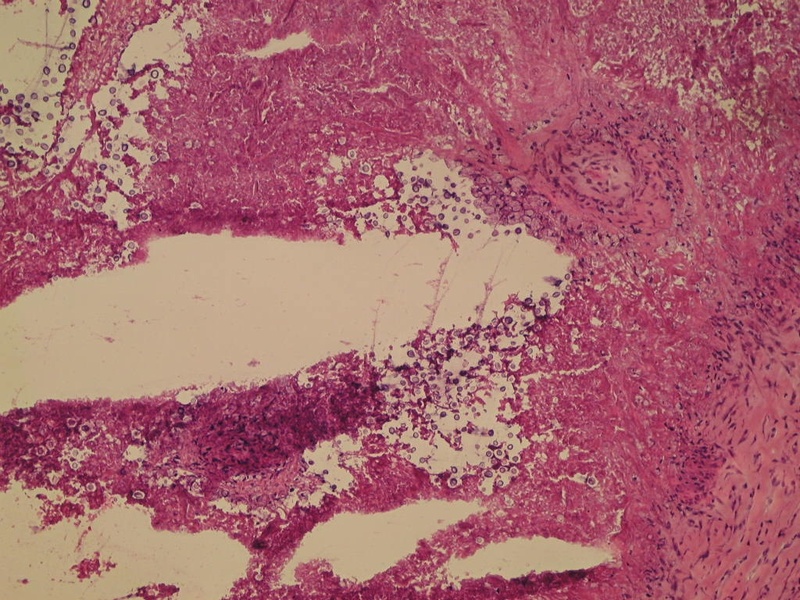 The frozen section showed lung parenchyma with a necrotizing granulomatous process with encapsulated fungal organisms, suggestive of Cryptococcus. 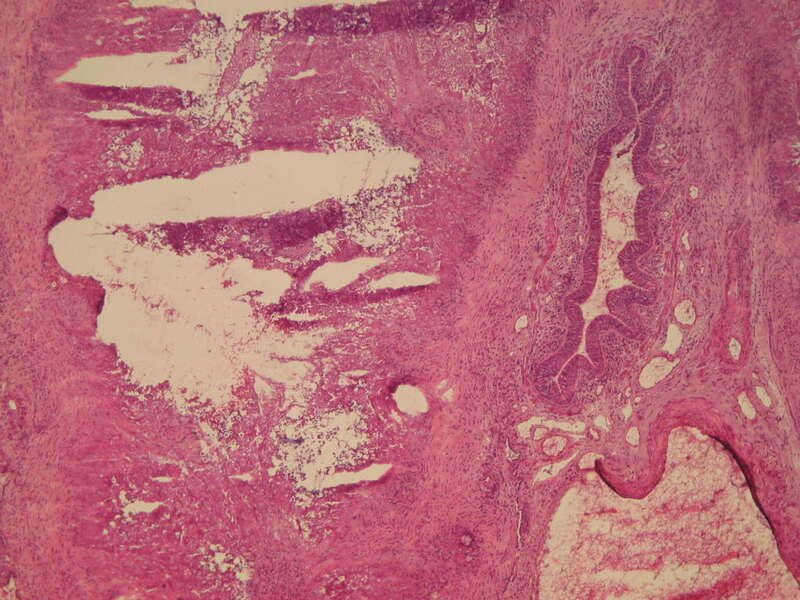 Adjacent to the necrotizing granulomata are alveolar spaces whose lining pneumocytes are plump and atypical. 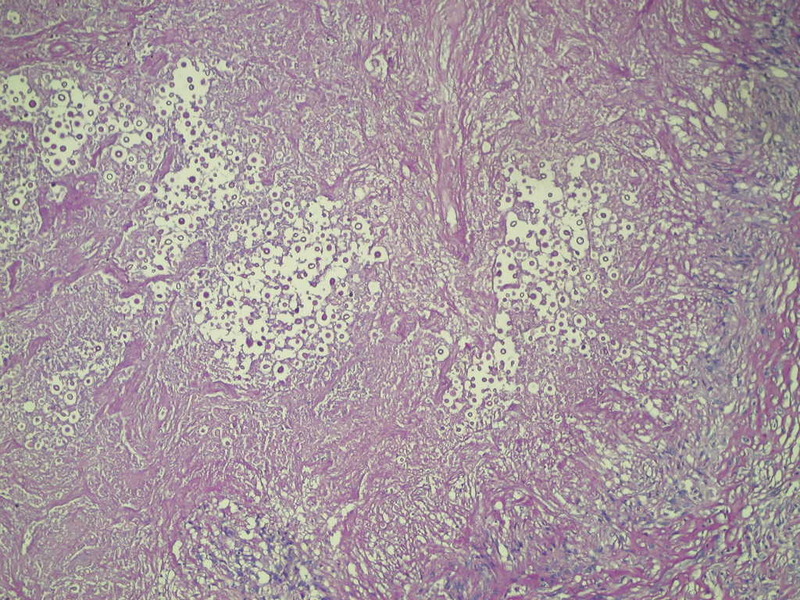 No carcinoma is identified. 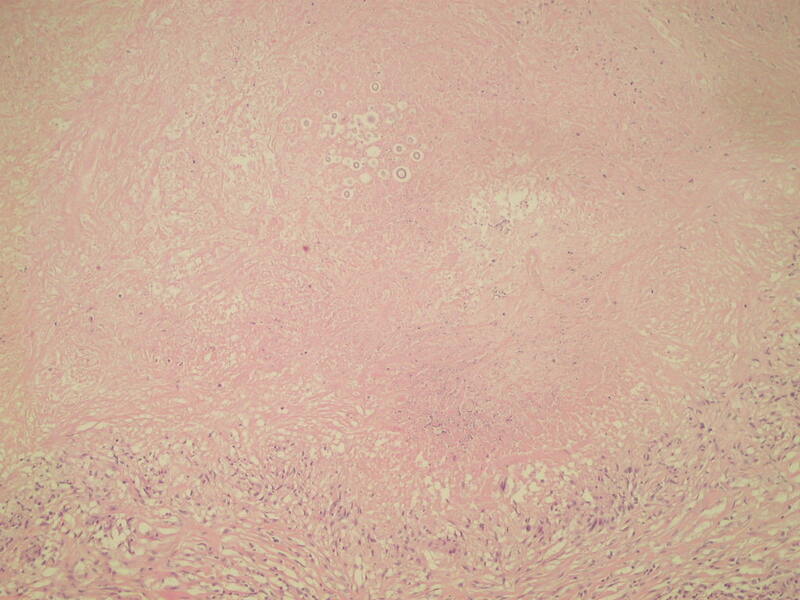 Permanent sections showed benign lung tissue with no evidence of malignancy. 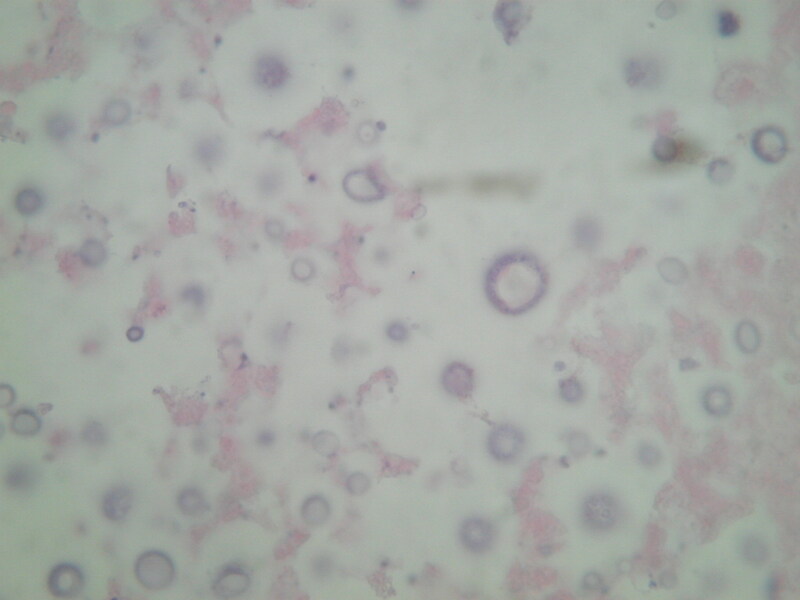 The presence of round, pleomorphic, extracellular yeasts with a large mucoid capsule, giving the appearance of a clear zone around a faint, round nucleus, is consistent with Cryptococcus. The clinical differential diagnosis includes malignancy (Rev Inst Med Trop Sao Paulo 2013;55(3), Eur J Clin Microbiol Infect Dis 2013;32:101). 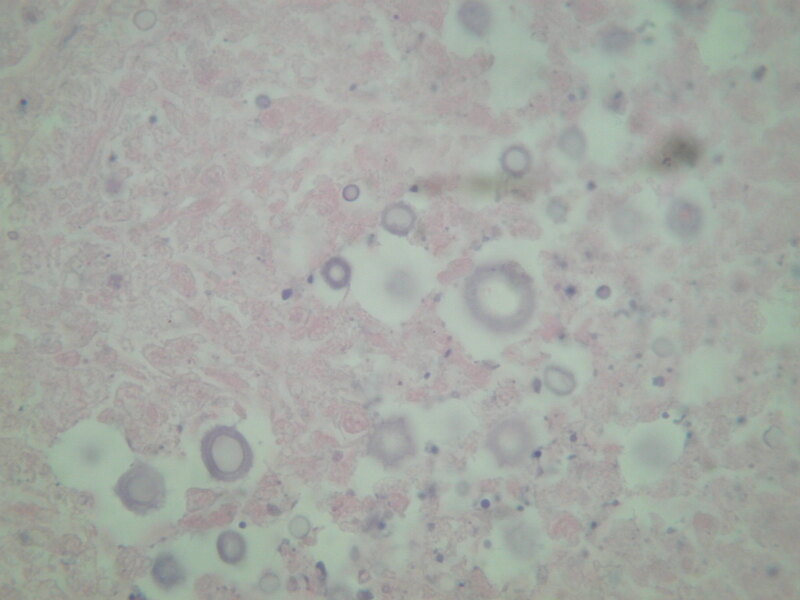 The histologic differential diagnosis includes Histoplasma, a small, oval, narrow budding, intracellular yeast, 2-5 microns, which causes deep fungal infections in specific US regions and internationally (eMedicine). The yeasts are often difficult to identify on routine staining, but GMS and PAS may be helpful. 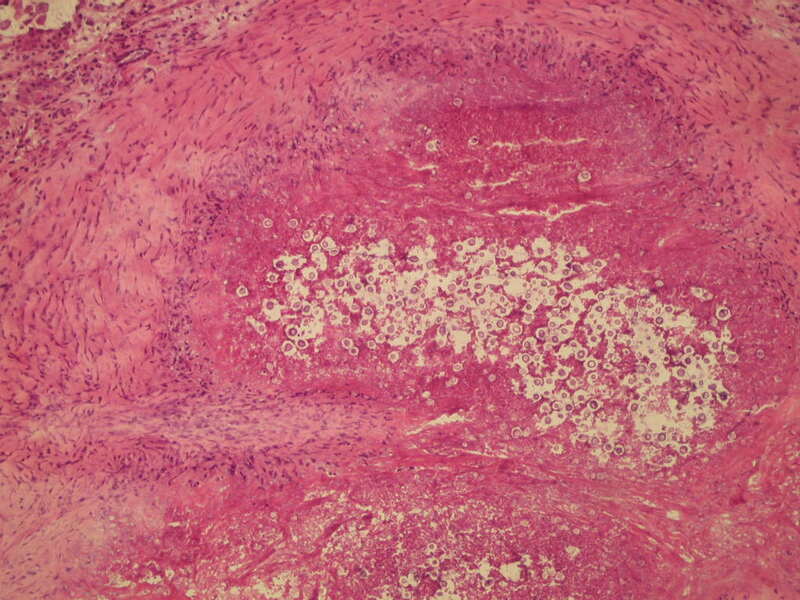 Acute cases may resemble lymphomatoid granulomatosis (Am J Surg Pathol 2010;34:541). 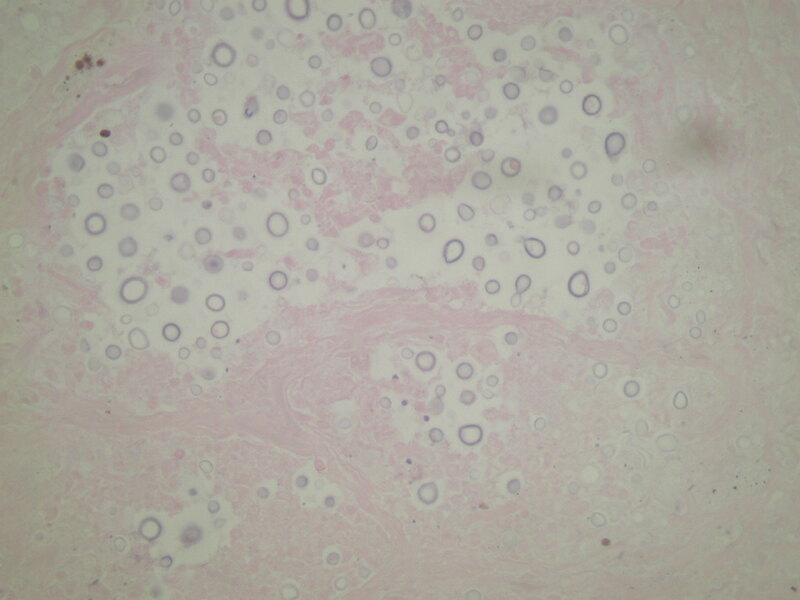 Blastomycosis, has large budding yeasts (10-15 microns) with broad based buds and refractile walls. 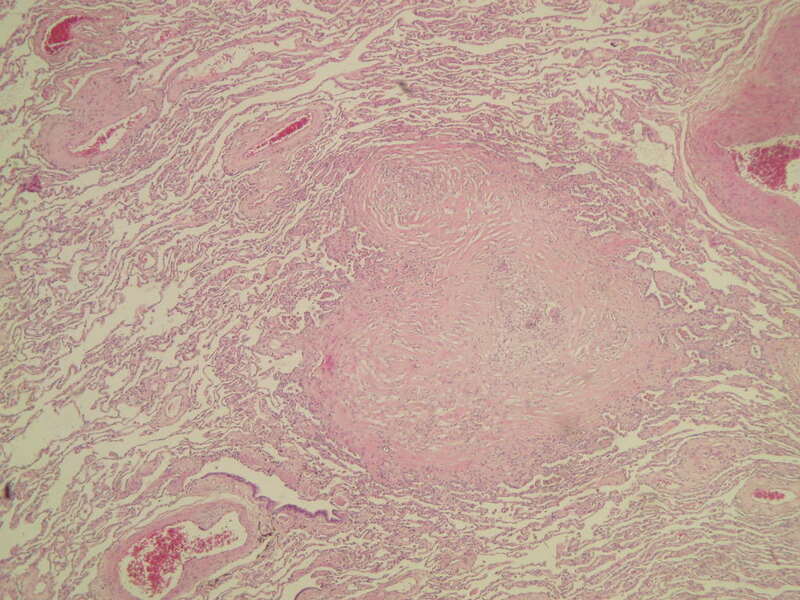 Coccidiomycosis, has large thick-walled spherules with variable sized daughter cysts. 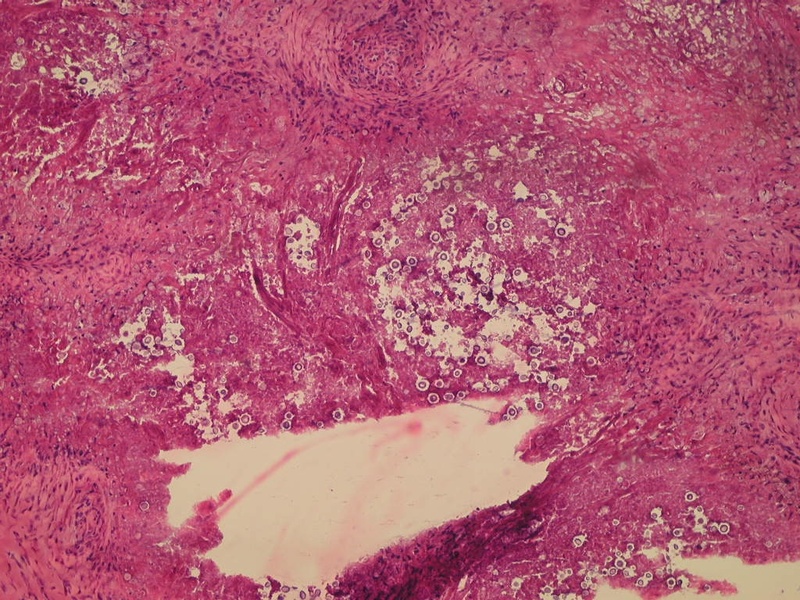 Although most immunocompetent patients are asymptomatic, treatment with antifungals may be necessary in neonates or the immunocompromised to prevent dissemination and death. Thanks also to Dr. Bobbi S. Pritt and others for their assistance with this Case.